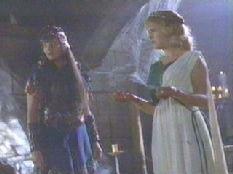 Xena and Gabrielle begin to confront their problems in earnest during the Temple scene. There are many things that one can question in the series Xena: Warrior Princess : the slang, dress, culmination of characters, roles of the gods and famous persons, time period, etc. One of the most questionable episodes is THE BITTER SUITE (58/312). Talking animals, Illusia, and singing are all things that, when we hear about them, we show skepticism and openly question them. However, unlike other aforementioned questions, the validity and reasons for taking chances in THE BITTER SUITE (58/312) are explainable. Within the land of Illusia, there are: overtly dramatic scenarios, continuously changing scenery, singing, unlikely companions, and other such deviations from "life as usual" for Xena and Gabrielle. However, everything that is given to us in this episode is done for complex and appropriate reasons. If we look at the introduction to Illusia, where Callisto sings her greeting to Xena, we realize that Callisto, just as Joxer will be for Gabrielle, is a guide in this land. Imagine that the world of Illusia is not another world or plane at all, but the inner world/s (the minds) of Xena and Gabrielle. If we grant that, then the symbolic meaning of Joxer and Callisto can be seen from another level: both of these characters are people whose opinions Xena and Gabrielle disregard for whatever reason. In Illusia, they are no longer Callisto and Joxer, per se, but a physical embodiment of that voice in the back of all our heads that questions our actions, or gives us warnings (which we usually disregard). In THE BITTER SUITE (58/312), they are the logical part of mind (personified) that is at odds with the violent emotions within each heroine. 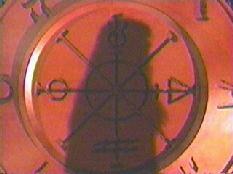 Callisto is Xena's 'guide' through Illusia. To kill your little friend? Or bring it to an end? Obviously this type of comment is truly out of place for Callisto herself. The very contradiction to her normal character lends credence to the argument that this is not Callisto at all, but an extension of Xena's own "ego" (in Freudian terms, ego is the thinking, reigning-in, controlling part of a person's psyche). Other characters represent the thoughts of Xena and Gabrielle, as well. Ares is one such character. Ares, however, is speaking more as the "id" (in Freudian terminology, the animalistic, sensual, urge-oriented part of a person's psyche -- the part the "ego" tries to keep in check). "You've proved to yourself, now that you've made the kill, that you're just like me with as evil a will...Imagine how awesome together we'd be...come melt into me," is a seductive pull towards power, anger and hate -- easy emotions to welcome, especially for Xena. For Gabrielle, her sister, Lila, is a representative. Lila sings, "If your child had lived we'd surely make her welcome, too," reinforcing Gabrielle's belief that Xena was always too hard and "too quick to judge" Hope. Chakrams, wheels, fortune and fate. Love, death, lies and hate. It is not just people, however, who are representational. The scenery in Illusia becomes important to our understanding of the minds of the characters as well. Both of the characters are first brought back into the past, to a place where they are more comfortable. In fact, the Potedians even say, "The past has set her [Gabrielle] free". The scenery is representative of past attitudes, which both Gabrielle and Xena slip into easily, enthusiastically taking up the new costumes and weapons that are pressed into their hands. Of course, for both characters, it is also past mistakes that they reacquaint themselves with. The people in the background scream, "Peace! War! ", and the characters make the mistake of thinking these are only answers. It is the past that leads Gabrielle and Xena into that dramatic, deadly clash of scythe and sword. Along with a way to interpret the memories and ideas surfacing within the minds of Xena and Gabrielle, we still need a tool to understand the emotions of the characters. Singing is not just another way to add to the flourish and dramatic nature of THE BITTER SUITE (58/312), it is also the means of discovering the heartfelt responses of the character without the self-consciousness they would have around the other characters in the real world. Xena sings, in an inner moment: These days have seen my spirit die, My life propelled out of control. She would, most likely, not be that forward or accusing in the real world. The guides, symbolic scenery, singing, and the confrontational setting are all crucial elements in bringing forth the problems at hand, and making them solvable. These elements not only explain the true situation and feelings of Xena and Gabrielle to us, they also explain the characters' emotions to each other. Without the world of Illusia, which is actually the characters looking within themselves, neither Xena nor Gabrielle would have been able to arrive at the appropriate solutions. The outside world put too many strains on Gabrielle and Xena, among them: vulnerability, diplomacy, silence, distrust. These are the things which clouded and confused the relationship. Our heroines needed a place where nothing could get in the way, and the only place that exists is in their minds. As Callisto said in the beginning, "By closing your eyes, you can see what isn't there". We were able to see with clarity, what was not visible: the inner thoughts, struggles, and emotions of Xena and Gabrielle. Brandy is a senior at Southwest Missouri State University seeking a BFA in Art with emphasis in photography. Most of her time is spent in the studio (except, of course, during those precious hours when Xena: Warrior Princess is on TV). She likes international travel, cats, cameras, sci-fi, writing, and bad, 80s British music.